Today, many couples are choosing to express their individuality with unconventional engagement rings. One way to break the mold is to use a gemstone that’s not a Diamond. Let’s explore the pros and cons of a few Diamond alternatives. 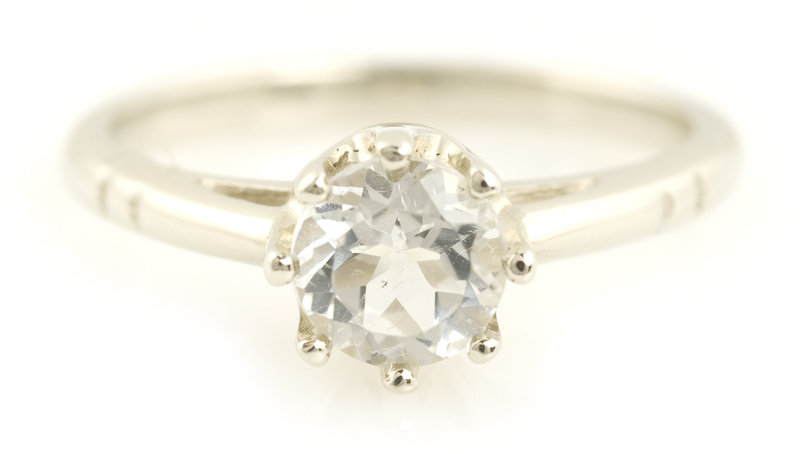 The alternatives to a Diamond for engagement rings are more varied than most people think. They range from gems worthy of the crown jewels to man-made imitations of Diamonds. Most alternatives to Diamonds have color which makes stand out from the traditional clear white Diamond. The most common Diamond alternative for engagement rings is Blue Sapphire. The Duchess of Cambridge, Princess Diana, Penelope Cruz and Elizabeth Hurley all chose a Blue Sapphire for their wedding ring. Sapphires (or Corundum) can come in any color except red. The red variety of Corundum is called Ruby. All of the colors are used as wedding jewelry, but blue is probably the most common. Corundum is a 9 on the Mohs hardness scale. Diamond is a 10, the hardest of any natural gem. Their hardness helps Sapphires and Rubies wear very well in engagement rings. There are also White Sapphires which look similar to diamonds, but they don’t sparkle like diamond. Jessica Simpson’s wedding ring is a Ruby with pear-shaped Diamond side stones. Mark Zuckerberg’s wife, Priscilla Chan also has a Ruby engagement ring. Oliver Martinez gave his fiancée, Halle Berry, an Eemerald engagement ring. Emeralds are not as durable as a Diamond or even Corundum. Their hardness score is 7.5 to 8, and they normally contain many inclusions. The inclusions can create a beautiful look, but they generally weaken the durability of a gemstone. However, a good jewelry design can help protect the Emerald in the wedding ring. Topaz is a beautiful stone that comes in a variety of colors, from yellow, to orange to blue hues. It is a strong stone, with a Mohs rating of 8. Another advantage is that Topaz generally tends to be very affordable. This is one way to get the color or size that you want while keeping the price in budget. 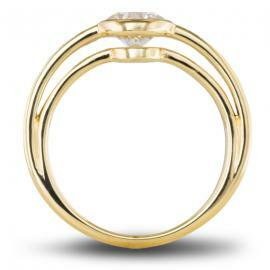 You can even get a clear Topaz engagement ring if you like the traditional look. Topaz is a great option for couples just starting out to get a ring with a nice, balanced look that can easily be upgraded to a Diamond or Sapphire later on. Wedding rings are generally worn almost every day. So, it is good to have a stone that will not chip or scratch easily. Anything with a Mohs hardness of 9 or higher is good, and should be suitable for daily wear. Stones that are 7 or softer like Aquamarine, Amethyst, Peridot, Pearl, and Opal will have difficulty standing the test of time. These softer stones will tend to look worn and abraded over time. Pearls are a very soft gem, with a Mohs rating of 2.5 to 4.5. Pearl jewelry is not meant for everyday use, which makes it a poor choice for an engagement ring. But, some antique wedding rings are Pearls. One way to have a Pearl wedding ring is to simply replace the Pearl when it becomes worn or broken. Generally, this is not very expensive. This next category of alternatives to a Diamond for engagement rings is counterintuitive: Diamonds can be an alternative to Diamond. When most people think of Diamonds they think of the clear sparkly gem. Believe it or not, Diamonds come in many colors. If you like Diamonds, but you don’t want a clear gemstone for your engagement ring, you can look into colored Diamonds. Blue, pink, red, yellow, brown, green and black are the most popular colors of Diamonds. Some colored Diamonds are priced much less than the traditional clear Diamond (e.g. black and brown). Other colors like red and pink can be much more expensive than their white counterpart. Many colored Diamonds were originally clear when they were mined and have been treated to take on their color. Natural colored Diamonds can be extremely rare auctioning off for millions of dollars. Man-made gems like CZ (Cubic Zirconia), Moissanite and the like are also alternatives to Diamond for a wedding ring. Most of these gemstones are made to look like Diamonds, but are available at a fraction of the cost. Lab grown diamonds are another alternative to consider. These are man-made diamonds that have the exact same chemical composition and properties as natural diamonds. Unlike CZs and Moissanites, lab grown diamonds look exactly like natural diamonds, and even gemologists can have difficulty differentiating them. If you’re interested in going this route, be sure to checkout Balance, our own unique engagement ring design featuring lab grown diamonds and recycled gold. Choosing an alternative gemstone for your engagement ring can be fun and exciting. As you can tell, there are many things to be aware of. If you have any questions about what gemstone you should choose for your unconventional engagement ring, please don’t hesitate to contact us.